Home > Shop By Brand > IGL Coatings > IGL Ecocoat Trim Kit 30 ml. Prevents trim fade and degradation! The IGL Ecocoat Trim Kit comes with every product and tool you will need to apply IGL Ecocoat Trim to your car plastic and rubber surfaces. IGL Ecocoat Trim is specially formulated to instantly bond with your trim surfaces on the molecular level to ensure proper protection and durability. Once cured, IGL Ecocoat Trim has a hardness rating of 6H that is sure to prevent damage from UV rays and other contaminants that cause premature fading. Thanks to the hydrophobic and dust-resisting qualities of IGL Ecocoat Trim, cleaning your trim will be worlds easier than it has ever been before! The trim on your vehicle may not be the first surface that people look at when recognizing your detailing efforts, but it sticks out like a sore thumb when it is neglected. The flaky, faded, white surface of neglected trim could make even the most expensive car look worthless. The key to making sure your trim looks as good as the day you bought it is by protecting it and preventing it from ever reaching the point that it looks cracked and faded. What better way to protect your trim than with a dedicated plastic and rubber trim coating like IGL Ecocoat Trim! Plastic and rubber can be difficult surfaces to protect properly due to their porous and textured nature. Many coating products end up not being able to properly cross-link and form a bond with these surfaces. IGL Ecocoat Trim, however, was designed with these surfaces in mind. 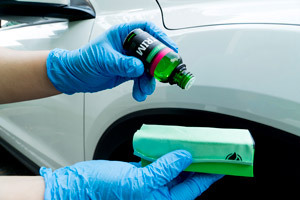 To ensure that IGL Ecocoat Trim will properly bond with your plastic and rubber, it was formulated using highly-reactive components that bond with plastic and rubber on a molecular basis. You will never have to worry about how strongly IGL Ecocoat Trim will be able to bond with your trim surfaces. After it has been applied to your trim, IGL Ecocoat Trim will protect your plastic and rubber from the UV rays that slowly degrade and dry them out. While UV rays are the main culprit in faded trim, they are not the only one. There is also a slew of contaminants that will wear your trim out as well. IGL Ecocoat Trim ensures your trim is protected from these as well thanks its hardness of 6H once it is fully cured. Another great benefit of applying IGL Ecocoat Trim to your plastic and rubber trim is that cleaning these surfaces in the future will be incredibly ease. These surfaces are often difficult to clean because they tend to absorb dirt and contaminants like a sponge. IGL Ecocoat Trim prevents this from happening by creating a hydrophobic and dust-free layer over the top of your trim. This layer will prevent any dirt, dust, or liquid from being absorbed into your plastic or rubber. If they are not allowed to penetrate the surface of your trim, these contaminants can be easily wiped or washed from the surface. Probably the best advantage of IGL Ecocoat Trim is the dark and rejuvenated look that it will apply to your rubber and plastic trim surfaces! Plastic trim has always been a concern for me. I've used several trim products and most last for a short time and never deter road film from storms on freeways. After applying IGL Trim for the first time I was impressed at the coverage and finished look. We just had two nice rain storms with all the summer dirt on the roads and IGL kept the dirt from adhering to the trim. Pressure washing made all road film fly off my trim. I'll see how long IGL last but for now it is a winner. One bottle can do three cars. ProsEasy Application and trim doesn't collect road film after application.